OK, spoiler alert for the next Meeples & Miniatures Podcast episode. Mike Hobbs recommended a book to me whilst recording the show, and I’ve subsequently pre-ordered it. Wargames Terrain & Bulidings: The Napoleonic Wars is by Tony Harwood (Otherwise known as dampfpanzerwagon) and is a complete ‘How to’ guide for making terrain in this era. I am looking to make a lot more custom terrain, and I need to make several buildings for my ‘Forager‘ project. I was originally going to use these modular buildings from Warbases, but I really fancy building from scratch. This should be a great complement to my copy of Issue 1 of Touching History, which covered the Peninsular War. 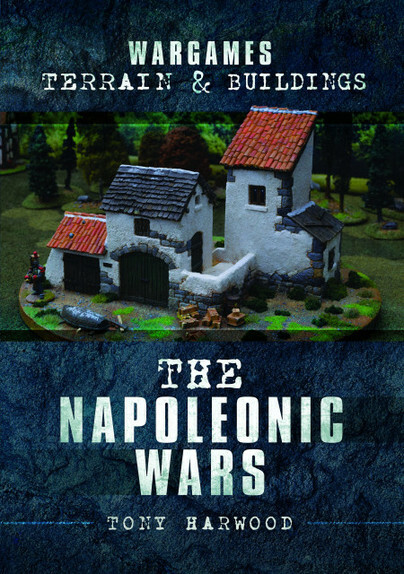 Wargames Terrain & Bulidings: The Napoleonic Wars is currently available for £11.99 and is due to be published on the 31st January 2019. Excellent. I have all of Tony’s previous terrain books, so this is a must-buy. Thank you for the plug. The book has been delayed slightly, but a published date of early 2019 has now confirmed by Pen & Sword. Book two in the series has been completed by me and is with the editor. I would hope to have more information very soon.